Infantile - ZineWiki - the history and culture of zines, independent media and the small press. Infantile was a pagan and occult queer zine from Toronto, On,. Canada. Nine issues of Infantile appeared in the 1990's. Each issue was created in the cut and paste method and is lavishly illustrated with historical material such as old drawings of Satanic rites, like Francesco Parmigianino's Witches' Sabbath, Greek, Roman and Hindu Pagan Gods and Goddesses, and Alchemy illustrations, combined with articles from newspapers like "Witch hunting in Russia", ads for psychics, contributions by zinester Glendon McKinney, naked tattooed men, photos of Nina Hagen, a drawing by Kathleen McCarthy Jenne, and absurdly cute kittens. 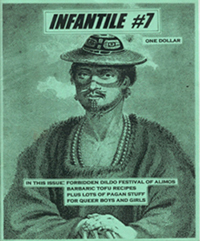 The design and illustrations of Infantile are integrated with many articles, stories, recipes and purported interviews, The zine maintains a delicate balance between satire and sincerity, irony and purposefulness, so that the reader takes nothing at face value, always looking for further, often humorous, meanings. This page was last modified on 23 November 2013, at 18:12.